This past weekend we went to my parent’s lake house in Sparta, Georgia for the weekend. 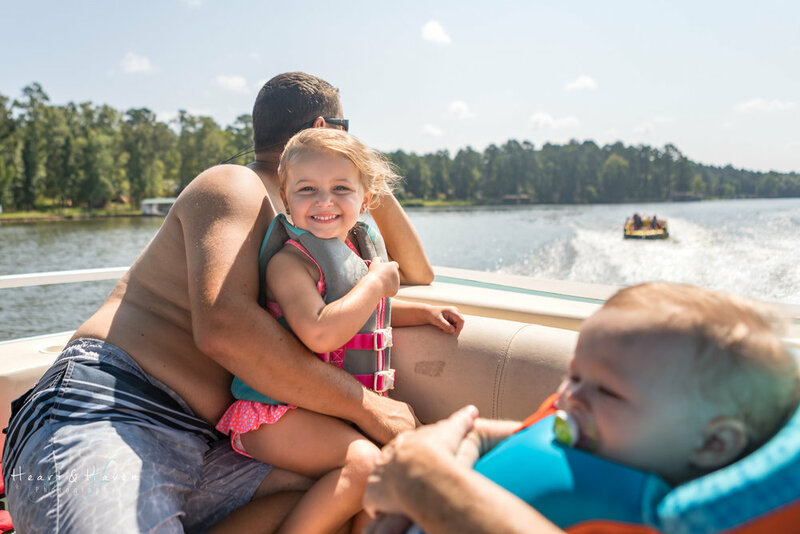 The lake house is on Lake Sinclair and is about three-and-a-half hours from where we live in Summerville, South Carolina. I wrote a blog earlier this summer with a little more detail about the area. If you haven’t had a chance to read that one, here’s a link so you can check it out. The area is literally in the middle of nowhere and a vast contrast to the Charleston area where we call home. This trip ended up being very last minute, as I decided about two weeks ago to keep my calendar clear of photo shoots so that we could go down and spend a little time with the family. It ended up being a very special trip because all of my parent’s grandbabies were together for the first time in over two years. You see my brother has three amazing children. Two of which, I have been able to see pretty regularly, but not as often as I like since I’ve had children of my own. We just do not travel as much as we used to and my brother and I both have busy lives. I unfortunately haven’t seen Rowan, his third and youngest, in more than two years. But after two long years of court battles and drama, she has finally been reintroduced to her family and rightly so. Rowan is a beautiful little girl and only 3 weeks older than Caden so I couldn’t wait for the cousins to be reunited! We also always have fun seeing Bailey and Brooks so this was setting up to be an amazing trip to the lake! Kevin, the kids, and I left for the lake late Thursday night after I finished up a sunset beach portrait session. This usually works best for us as the kids sleep while we drive, but Cade gave us a hard time in the car because he couldn’t get comfortable. Who can blame him, I wouldn’t want to sleep in a car seat either. Ellie on the other hand was out like a light as soon as we pulled out of the drive way and didn’t wake up until we got there. We didn’t get to the lake house until 2AM which was a bad idea. Every time we arrive, the kids having slept for a couple of hours in the car, are all refreshed and ready to go. On the other hand, Kevin and I are exhausted and just want to sleep. Needless to say, we didn’t go to sleep until around 4 AM. For a moment, I thought I was back in my partying college days except no alarm clock or hangover to wake me up….just two hungry kids. My how life has changed. Fridays are usually spent with just the four of us enjoying the lake house and time together while we wait on the rest of the crew to show up later that night after work and school. This Friday started off with an unexpected “emergency” and first. Out poor little Ellie got stung by two wasps. Yep, we were on the porch, enjoying a cooler late summer morning, sipping coffee, when these two little beasts of wasps came out of nowhere and swarmed my poor little baby! It was like they knew who the weakest link was and went for her. She also happened to be standing very close to their nest. However, Kevin had been sitting in the chair where their nest was for 20 minutes prior to this and they didn’t strike him! They got her a total of three times. She fortunately handled the stings like a champ. Later that evening the rest of the crew arrived, and the fun started. We only got to spend one full day together, but it was a great day. 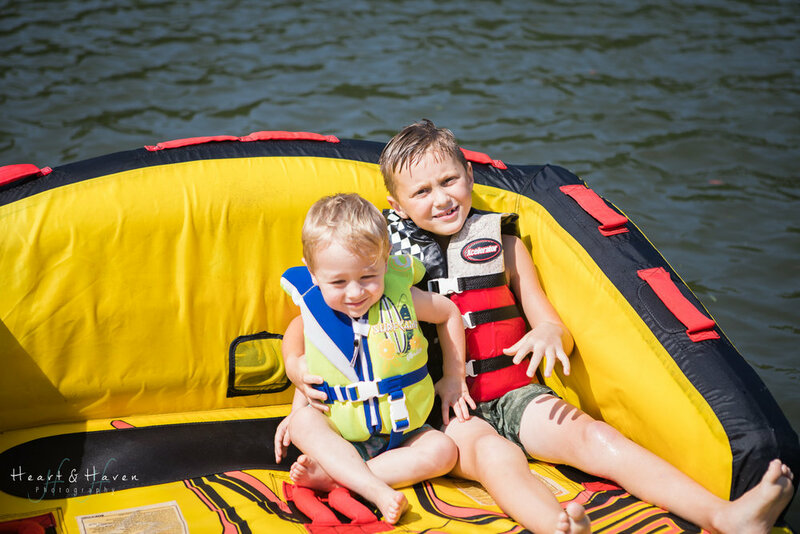 We played….boat rides, tubing, and in the lake house. We talked and laughed a lot! We ate lots of goodies as you see it’s a lake house tradition that at least once a day we stop at the marina and everyone gets an ice cream to enjoy. We grilled awesome ribeye steaks and just enjoyed each other’s company. I REALLY wanted to get all the kids and get one decent picture of them all together, but that didn’t happen. Maybe next time. I am always super tired after a lake trip. I guess it’s because of the all the packing, driving, fun in the sun, etc… but something about going “home” and seeing the people I call family refreshes me. You can talk to people on the phone all the time, but there is just something about getting hugs in person that does wonders for the soul. So when it comes to my photography, I want you to feel all the feels every time you look at your images. I want your soul to smile as you remember your session and the moments we captured. Maybe one day, if you are homesick, or missing someone important to you, my images will take you back and replace those negative feelings with just a little bit of joy. Enjoy a few pics of my family on our weekend lake trip! I have a couple more pics I am going to wait to share so stay tuned for my next blog!